I am back from my little sister’s big fat Indian wedding. What a way to start the year: 10 whole days of lunch and dinner events. The trip, for a glutton like me, was like Christmas, Diwali, Eid and a lottery win arriving all at once for a tramp. Every morning started with a regal buffet at the Hyatt Regency in Kolkata. Then onto a vegetarian lunch function of samosas, chaat, pakoras and mithai cooked by the family Halwai. Fittingly ending with a vast catered banquet of meat curries, fried fish, creamy coconut prawns, rich pulao and paneer and vegetable sabzis. All waiting to be mopped up with freshly roasted tandoori and roomali rotis from the “live counter”. Oh, and copious amounts of booze, sometimes bootlegged inauspiciously in mini mineral water bottles. I was busy constantly. It takes effort to be glamorous at all times. Then there were the kids, who had to be dressed and fed and pandered to in the way they had quickly become accustomed. I had my new brother-in-law’s leg to pull and my sister to torment. And, of course, weaving through the food service teams making friends with the chefs and taking furious notes. Much to their amusement. The one thing I gorged on was meat-on-the-bone curries. From goat stewed in a fresh green chilli and coriander marinade, to giant whole prawns in their shells steeped in a sweet coconut base. These curries are hard to come by, unless I cook them myself here. And that’s such a shame. 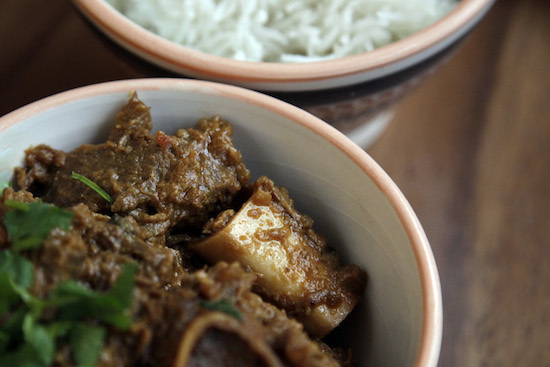 Bones add not only nutrition, but also real depth of flavour to curries. Yes it slows down the cooking time, but this is a sacrifice worth making in my books. Unless the recipe calls for boneless meat, of course, or you’re in a massive hurry. Here is a recipe for Kashmiri Gosht, a rich, dark stew of lamb shoulder with bones, in ginger and whole spices from Madhur Jaffrey’s Curry Nation cookbook (which I featured in). The recipe in the book uses a fantastic Kashmiri spice paste Basaar in it by Yasmien Bagh Ali, also featured here. But I was lucky enough to have the prerequisite ginger, fenugreek and Kashmiri chilli powder from mother’s last visit. Now for more of the same this year. Hope your year has started as eventful. Wishing you the best of food, fun and frolics in 2015. Peel and slice the onions finely. Peel and grate the ginger and garlic. Next, bring the oil to medium heat in a large, heavy bottomed saucepan. When it is hot, toss in the whole spices, and as they sizzle up, the sliced onions with a pinch of salt and saute for about 15 minutes until golden. If the onions start getting stuck to the bottom of the pan, ad a little hot water and scrape off. Then, mix in the ginger and garlic and cook for another minute. Roughly chop the tomatoes and toss them in. Cook this masala paste for about five minutes, stirring regularly. When the tomatoes start to disintegrate, mix in the coriander, fenugreek, paprika (or Kashmiri chilli) and chilli powder. Add half a cup of hot water and keep stirring. As the water cooks off, lower the heat to a simmer, add another cup of hot water and cook for another five minutes. At this point you will see oil oozing out of little pores in the paste. Bring the heat to medium high again, and stir in your lamb chunks. Mix the paste into the meat well, browning it for a good five minutes until it’s well coated. Then add enough hot water to cover the lamb pieces, cover and cook for half an hour then take the lid off and cook for another half an hour uncovered. Stir in salt and garam masala to finish, simmering for the last 10 minutes until you have a rich, dark, moist lamb curry. Garnish your Kashmiri Gosht with chopped fresh coriander if using and serve hot, with rice and a thick dal. Welcome back. I have put on 10lbs from reading your description of the delicious food that you have been devouring. It was Madhur Jaffrey’s book that originally made me aware of you. I then bought your book and I’ve been a fan ever since. The above should be on my table soon, I have everything except the meat. I’ve been wondering how to use any of the bottle of ground fenugreek that’s in my spice drawer! Thanks, this looks delicious and I’ll give it a try. As for your big Indian feast/wedding experience – what wonderful fun! Happy new year to you. Indian weddings are grand and your sister’s seem to have been grander. Love the gosht you have here but one question instead of simmering on the stove top how about using a pressure cooker? Hi Ann – How lovely, I had no idea! Hi Laurie – really hope you enjoy it. Hi Indosungod – great to hear from you! The taste of this dish really comes from the slowly darkened masala and stewed gosht. I would advise against the pressure cooker for this one. Loved this recipe, we made it in our brand new slow cooker yesterday which we’d putting off making use of. Once I saw this I said to hubs “This is the one. The inaugural recipe” Turned out lovely and comforting in the dull, gray, cold and then not cold bay area weather we’re having here. Thank you for your recipes. I’ve made this dish week ago at my friends house. Everyone was delighted how good it was. Im polish but worked at Bangladeshi restaurant for 5 years doing deliveries. During that time I fallen in love in indian cuisine. We as a nation don’t eat spicy food but I absolutely loving it also my friends. Will definitely try more of your recipes.